I like Tom's ice fishing - I have done the other kind, but not anymore. My resistance to cold has plummeted faster than a one-legger in a ice fishing hole. I go ice fishing anytime I can. There's already 15 inches of ice here but it's still not the safest. With such a snow load and warm weather some of the lakes that have a current or beaver houses on them are having problems with the snow pushing the ice down and some water on the top. You get that slush and sometimes the ice will start to rot with the warm weather. The lake I normally go fishing at is alright where we go. There isn't any beaver houses in sight. The fish have been biting too so it makes it worthwhile to go out. The only other problem is to get on the ice. We have so much snow that you either have to snowshoe or snowmobile to your fishing spot. The snow is over 3 feet deep on average. I like Tom’s approach to ice fishing so I do my ice fishing in the frozen food section at the market. If I was going to ice fish, I like the idea of the motor home. Up our way some folks have some pretty spanky bobhouses. It's like fishing in the living room . I met my girlfriend up in MN this last summer. I was talking to her a couple of weeks ago after I had gone fishing one late afternoon. When I told her that I had gone fishing, she responded by saying, "Oh, so you have a fishhouse?" She forgets that I live in OK where it doesn't usually get cold enough to freeze the lake around here...especially where I was fishing in SE OK. I think it was well over 70 degrees that day. It's going to be a big adjustment for her when she gets down here...she'll have to get used to being able to go outside most any time of the year without the possibility of freezing her tootles off. That is the ultimate fishing shack. Does it have a little boy's room too? It only looks big enough for one or maybe two people at the most. Gotta have it bigger so the whole family can use it at the same time. Heck need a couple of fold away bunk beds too and a cookstove. Little boys don't need a room. They do when it's that cold. Here is a recent article from my old country. I think you guys are doing it wrong. I took this picture one morning this week on the way to the woods. This is from the Hwy 77 bridge over the St. Croix river right at the MN WI State line. 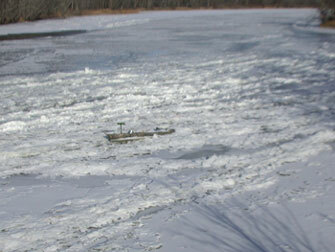 If you can't see clearly, there is a boat with trolling motor, depth finder, and minnow bucket froze in the ice. I am not sure of the story, but I think it goes something like this. Everyone knows there are huge sturgeon in the St. Croix River. Back when they built the I-94 bridge at Hudson, WI they sent divers down to check the bottom for the placement of the bridge piers and they saw sturgeon so big the divers refused to go back down. When the people in Hudson fish for Sturgeon, they use a chunk of beefsteak on a cable that is attached to the concrete bridge adbutments. They check the cable every morning and if the cable is as tight as a piano wire, they know they have caught a sturgeon. Then they slip a pulley over the wire and pull the sturgeon out with nothing smaller than a one ton truck. Obviously this ice fisherman caught a sturgeon and it pulled him from open water into the ice, piling ice up ahead of the boat until the boat would not go any more. Then the poor ice fisherman was pulled right out of the boat under the ice and the sturgeon ATE HIM!!! I swear that's true, or it's true I swear!! One or the other. OK if it isn't true, then make up your own story cause I don't really know what happened. That's a good story. Had me goin right along with you for a spell der. Ya shoul'nta added that last part about gettin et up. In the pic, I see a tip-up sittin over a hole in da ice. Not sure how it got to be dat big fishin boat (beginnin to soak in tho). I found out that ice fishing is illegal here in FL. I guess I was skating on thin ice. I'll throw'em all back next time. Your lucky the evidence disappeared like it did. Impressive !!! I've lived in places that weren't this nice . I'm just getting ready to head out to Tattamin lake. We head out there evry year at this time to fish for the largest lake trout in the world. Now I know it sounds like a fish tale, but we catch 40-60lb lake trout here. The lake is frozen around 24" thick so there is no problem driving the skidoo out on the surface. I am taking the camera with and I'll post some pictures when I get back. I never met a tree I didn't like!! What do you use to cut a hole big enough for those monsters? Page created in 0.842 seconds with 39 queries.